As Los Angeles continues to struggle with lagging development pace as compared to the national pace of housing creation, communities across the city grapple with the potential implications of permitting increased density. The dueling priorities of providing much-needed housing in one of the nation’s fastest-growing markets and maintaining neighborhood history and character continue to square off as the city assesses development across its many communities. The conflict between neighborhood character and future growth is far from new, but the first half of 2017 saw significant contention in this area as voters defeated Measure S—also known as the Neighborhood Integrity Initiative—on March 6. While Los Angeles voters decisively rejected Measure S, which would have placed a two-year moratorium on some types of high-density buildings, the lead-up to the vote was costly and bitterly contested, as neighborhood activists faced off against labor unions, real estate developers and Los Angeles Mayor Eric Garcetti. But while some celebrated the defeat of Measure S, many of the issues that spurred proponents of the measure remain unresolved. Shortly before the Measure S vote, in February 2017, the Los Angeles City Council voted unanimously to require updates to its community plans—which define permissible development in specific neighborhoods across the city—every six years, a response to criticism by community groups and Measure S proponents that outdated community plans have caused piecemeal “spot zoning,” leading to inconsistent development that undermines neighborhood character. An ordinance effectuating the six-year update schedule is being developed. More frequent updates to the community plans will mark a significant departure from past practice, which saw updates to only four of the city’s 35 community plans within the past 10 years. Meanwhile, the city continues to wrestle with rising homelessness, despite four statewide laws that went into effect at the beginning of this year amending the State Density Bonus Law to provide additional incentives for developers to include subsidized affordable housing in their projects. Los Angeles County’s most recent survey showed a 23% increase in the county’s homeless population over the last year, even with improved efforts to place homeless individuals in affordable housing. 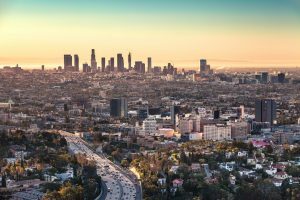 Los Angeles County Supervisor Janice Hahn called the results of the survey “staggering,” but consensus as to where and how additional development should be sited has yet to be reached. While the need for additional housing is almost universally recognized, some argue that certain residential neighborhoods should be protected, and that higher-density development is more appropriate for transit-oriented and neighborhood-serving commercial corridors. More aggressive review of the city’s development plans will most likely bring continued conflicts over density, neighborhood character, and the role of transit projects to the fore. As future review of community plans advances, stakeholders must be prepared to confront challenging questions about the character of Los Angeles’ neighborhoods—and the changing vision of Los Angeles as an increasingly more dense, transit-oriented urban environment.